The Rig Veda, written in India about 1500 BC, praises a holy plant called Soma, which is sacrificed and consumed, granting the drinker an experience of enlightenment and ecstasy. The late R. Gordon Wasson identified Soma as a "magic mushroom," Amanita muscaria, and he and his followers discovered that such Indo-Europeans as the ancient Greeks, Iranians, and Norse had also used a Soma-type plant. 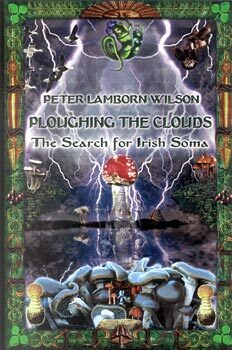 In Ploughing the Clouds, Peter Lamborn Wilson investigates the probability of a Soma cult in ancient Ireland, tracing clues in Irish (and other Celtic) lore. By comparing Celtic folktales, romances, epics and topographic lore with the Rig Veda, he uncovers the Irish branch of the great Indo-European tradition of psychedelic (or "entheogenic") shamanism, and even reconstructs some of its secret rituals. He uses this comparative material to illuminate the deep meaning of the Soma-function in all cultures: the entheogenic origin of "poetic frenzy," the link between intoxication and inspiriation. "[Ploughing the Clouds] is the best thing of its kind since Robert Graves's The White Goddess." "[This book] brings new perspectives to the problem of Soma and broadens and deepens the context of its discussion. Information on possible Celtic relationships with psychoactive plants and fungi are most welcome."